Nintendo has fulfilled their promise of providing an extensive launch line-up for the Wii U, with an impressive number of titles, both retail and digital, being offered by a variety of different developers. One such developer, Shin'en, a well known official Nintendo third-party developer since 1999, is one of many reasons the eShop is off to such a great start. 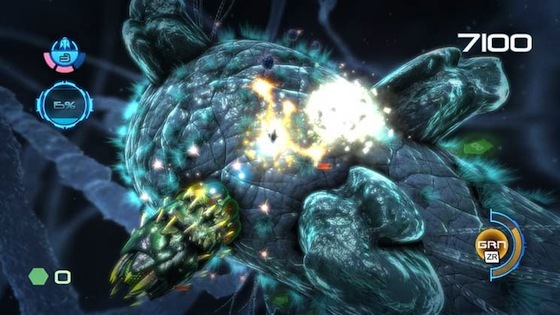 Nano Assault Neo, a game based off their recent 3DS game Nano Assault, is here to ensure Wii U gamers get their fast-paced twin stick shooter fix from the very start. The game itself plays like a standard twin stick shooter (think Geometry Wars and the PS3 game Super Stardust HD). For those unfamiliar with the genre, your basic actions consist of mainly using the two analog sticks for all the action: use one stick to move your ship in any direction while using the other stick to shoot (infinite ammo) in any direction independently of where you're moving. On top of that, you'll occasionally use an additional button for secondary weapons. Oddly enough, when you read the in-game manual and even start up the game itself, there is not even an attempt to explain the story to the player at all. Unless you played the 3DS game, you may not realize right away that you're actually controlling a tiny little 'Nanite' ship inside the deadly Nanostray virus in order to stop it from spreading and contaminating civilization. Your vessel navigates through alien cell clusters! I suppose you could deduce something like this from seeing the enemies and environments you're dealing with. Though this background is ever explained, the lack of story in no way hindered me from enjoying the game. Having this knowledge makes for a more satisfying experience though; the player can surely appreciate the visuals more so when considering much of the game's elements potentially have some grounding in reality. The point is, the player is immediately thrown into the action because that's basically all that really matters. Realizing you're shooting stuff at the microscopic level makes you appreciate the amazing photorealistic graphics even more! I can't speak for other Wii U eShop games at the moment as I haven't played others yet, but this game is definitely one I plan to show off to friends as a display of the Wii U's graphical prowess. Granted, the areas are fairly small, and so the graphics engine doesn't need to run some massive world… but even compared to Nintendo's own offerings in games like Nintendo Land and New Super Mario Bros. U, Nano Assault's graphics definitely stand out among others. Each of the environments is unique in design and look; the textures look fantastic, and I never notice any slowdown as the areas rotate about smoothly (I see no drop in the 60 fps) with all kinds of nice special effects such as small swaying 'hairs' that resemble foliage (these are likely flagella and pili as seen on prokaryotic cells, for you biology fans out there!). You'll see beautiful bodies of water, crystalline structures… on top of it all, every small detail catches the light sources so flawlessly, and seeing it all in motion is a sight to behold. So how is the game structured? The basic mode you'll likely start out with is Single Player. You select a 'cluster', which is a group of four consecutive levels called 'cells.' In each cell, your main objective is to eliminate 90% of all the enemies, and there's no time limit. As you destroy enemies, more enemies spawn in and add to the horde, keeping you on your toes at all times and in general challenging you by constantly keeping you moving to avoid destruction. Once you meet the 90% mark, an exit appears, at which point you do have a short amount of time to reach the exit (you'll get a nice bonus if you manage to clear the remaining enemies before exiting). While playing the game you'll pick up credits, which you can use to buy upgrades and weapons after clearing each cell. Using your credits wisely is an important part of your strategy in order to finish the cluster and get the best possible score. The fourth cell always ends up being a direct boss battle and is over pretty quickly. The Wii U GamePad is quite useful in the game. When playing alone, you have a view of the entire cell on the left side of the touch screen. This mini-map shows enemy placement and item locations. A useful feature with this mini-map is you can simply touch it and rotate it to see where everything is on all sides of the cell. Shin'en did a great job with this feature; the game will automatically pause when you're touching the screen. Also, on the right side of the screen is a diagram showing the placement of your helper satellites. These guys shoot alongside with you to increase your firepower. A simple but clever idea here is you can move them to different positions surrounding your ship, and you can also rotate them to the angle you want them to shoot at. It's all very simple to do with the touch screen and adds another layer of strategy; certain satellite formations work better based on the level you're in and the kinds of enemies you're facing. Regarding those satellites: the downside of having them is it makes it much more difficult to distinguish between your ship and the satellites when they're all floating close to you, thus preventing you from avoiding hazards when your surrounding space is highly constricted. To expand on the usefulness of the GamePad, at any time you can easily switch the game over and play entirely on your GamePad through the pause menu (the TV display is disabled). There's also a fun 2-player cooperative mode, where one person plays on the GamePad screen while the other plays on the TV screen. This great feature of allowing two players to have their own screen is already becoming a standard option for many Wii U games. 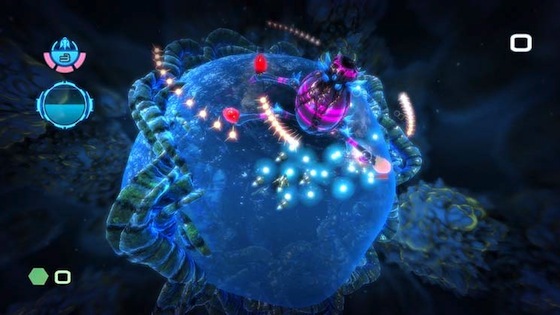 The level designs are quite imaginative; each cell is a unique shape that your ship can fly completely around. The cell behaves much like a small planet (though your ship is basically attached to the ground as it is hovering just a little over the surface), and these different shaped cells will remind Nintendo fans of Super Mario Galaxy's planetoids. Part of the fun and challenge comes not only from the enemies, but from the environments themselves. Some cells feature hazardous barriers that you have to carefully avoid in the midst of battle. The different contours of the cells themselves makes it more challenging to guide your shots as your bullets curve and conform to the shape of the terrain. One small complaint I do have about these cells is that they don't always work well with the auto-camera the game has in place, and sometimes the camera angle works against you, making it difficult to discern enemy bullets against your own. Perhaps one of my favorite aspects of the game is the excellent leaderboard setup. The game is seamlessly integrated with the Wii U Nintendo Network and your Nintendo Network ID, so that as soon as you complete a cluster and see your final high score, you're quickly taken to the worldwide leaderboards and can easily see where your score falls among other players. From there, all it takes is a simple button press to the see where you rank against users on your friend list! It's very fast and seamless. If there's anything to consider as a 'disappointment' with the game: it is fairly short; I cleared all four clusters in the Single Player mode (essentially 16 levels) in about three hours, and that included spending time restarting clusters after losing all my lives and in general just getting better with practice. Having said that, I've already added on an additional hour or two just playing Survival Mode and Arcade Mode to get better scores. There's also a very challenging list of achievements called 'missions' (14 total), and what I love about these is that the leaderboard will even display your total accomplished missions for the world to see. The replay value is sufficient enough that I feel I definitely got my money's worth. With the excellent leaderboard setup and potential for improving my high score (plenty of challenge on that one), I can easily see myself coming back to this game very often. Alright Negative World, see you on the leaderboards! This game is currently available on the Wii U eShop for $9.99 U.S.
Nice review! This will probably be my first eShop purchase once I've put more time into NSMBU. Awesome review and will be looking to pick this up when I receive my system. I bet this will play great on the Gamepad while the kids are watching the TV. Excellent! If I hadn't already bought this game, I would now. BTW using those excellent leaderboards I saw both you and Guillaume are in front of me on the first cluster. We're all in the top 100 worldwide (for now...) NEGATIVE WORLD REPRESENT. Yes, totally understandable. You have a nice review over at NWR! Nice job on the leaderboards, you're quite the competitor Guillaume. I shall give it my best. Thanks for sharing tips on Miiverse. My goodness, Miiverse is all kinds of awesome, especially with the screen capture tool! It's sooo good. Nice review! I may give this a download once I add some funds to my eShop account. Awesome review @Eric! I'll definitely be getting this game as soon as I get a Wii U! Does the OP know that this review is featured on the website for the game? IS THAT A MONEYHAT I SMELL???????????????? Did the cash come in a silk top hat or some kind of beanie? How did you afford that monocle? YOU'VE BEEN OUTED, SHILL! WE'RE THOUGH THE LOOKING GLASS, HERE, PEOPLE. Nice job on the review, it's definitely thorough and informative. I played the 3DS original, and thought it was pretty so-so in many respects, though the improvements here sounds great. I'll pick this up if it goes on sale. How does this game stack up against other space shooters not exactly in the same genre? For instance, did you play Gradius ReBirth at all, or some of the old "classics" on NES? I'm a huge Life Force fan (so big), but this looks a little more confusing, and easy to get lost in it. I know that looking at it is easy for you, but you say "notice the support satellites around your ship," and I have to squint for it. Seems tough to keep track of! I was going to ask about the backgrounds, too, which isn't apparent by the pictures, but you likened it to Super Mario Galaxy-esque planetoids, and that answers my question perfectly. I'm pretty sure I played / watched something like this at Negative World Meetup: Montreal, and I'm not entirely sure if I'm coordinated enough to do this thing successfully to my pleasing. After reading some other reviews, I'm now beginning to notice that I ONLY play longish games with a heavy commitment! I constantly feel kinda run-down by games (unless I'm super-excited about them); I think you guys might be on the better plan, haha. It's not really like Gradius / etc. at all as those are based on getting through levels but this is more freeform. You're put on a tiny cell and just fly around destroying enemies for points. So you're not going through a linear level or anything, you're just flying around the same places on the same cell until you kill enough enemies to move onto the next one. Zero is right, this game is more freeform. Yes, I'm familiar with the classic space shooters (I love Life Force ). Hhm, let's look at another game as an example. Think of the two types of game play modes in Star Fox 64. Star Fox 64 also has the open area battles like a large arena, including some of the boss battles. You're allowed to fly all around in your arena, back and forth, and shoot enemies as they appear from all directions. Remember the Katina battle? Some levels in Nano Assault Neo are kind of like that! Well, that analogy isn't perfect, now that I think about it. Even in the open area SF64 battles, your ship would always be moving forward as well. 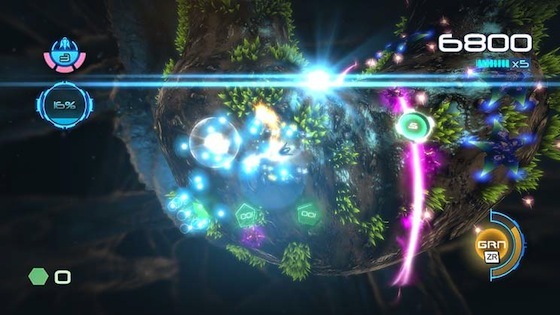 In Nano Assault Neo, you can simply stop your ship in one spot and shoot all around you in any direction if you so desire. Haha, well I like to play both kinds of games actually. My last 'longish' game I reviewed was Assassin's Creed III, which I'm guessing you may get a chance to read soon since you're apparently reading all the latest reviews like a madman today! Yeah, those levels were cool. I miss Star Fox 64. Are we getting Star Fox U? Awesome review. I just bought the game and its amazing. I don't need video games looking any better than this. This is amazing. Did anyone else get a Metroid Prime vibe from the menu music and graphics? Sets the mood perfectly for this eerie shmup.